As you probably know, the Nuna Mixx became an instant hit as soon as it was released a few years ago. Parents loved its stylish look and amazing features like flat recline, huge basket, reversible seat, and large all-terrain wheels. So, I was very exited to see the new Nuna Mixx2 2017/2018 model which is very similar to the original Mixx model except for some luxury upgrades. The Mixx2 has a hand-sewn vegan leather handle bar and bumper instead of the rubber one. The frame is dark matte instead of silver. It also has chrome accented black wheels which look soooo sleek. The UPF 50+ canopy now has a double quilted stitch work underneath. The fabrics have been also upgraded to the hand picked tweed textiles blend. But, the biggest update is a bassinet option that connects directly to the frame without any adapters. The lack of the bassinet was one of the biggest complaints from parents. The Nuna have also finally added some accessories so now you can get a child tray, cup holder, footmuff, and travel bag. Lack of accessories was another complaint. This buggy can also transform into a travel system with a color matching Pipa car seat (sold separately). Just like the original model Mixx2 2017/2018 features a huge UPF 50+ canopy with mesh side windows, large peekaboo window with a magnetic closure, adjustable leg rest, one-hand true-flat recline, adjustable handle bar, swing-away bumper bar, flip-flop-friendly brake, and large basket. The fold is easy and compact. The foam filled all-terrain wheels together with all-wheel suspension provide a very smooth ride. The maneuverability is outstanding! Despite all the updates the weight still stayed the same at 25 lbs. I gave it 5 out of 5 stars because I was very impressed with all the upgrades and I think this might be my FAVORITE stroller for 2018. I love the bassinet option and Pipa is one of my favorite car seats. The dark color of the frame and the wheels gives it a modern look that all parents want. It pretty much has everything on my list and there is nothing bad I can say about it. Can you believe it? In fact, I like it so much it has made it to my ‘Top 20 Best Strollers‘ list two years in a row. The only thing I would like to see is ability to work with other car seat brands. That’s it! The Mixx2 by itself retails for around $599 and comes with bumper bar, rain cover and car seat adapter for Nuna Pipa which is one of the best car seats on the market. You can also get a bassinet. Note: There has been no changes for 2018 accept for the new colors. -Large canopy. The expandable UPF 50+ canopy has two large panels and a pop-out sunvisor that could be tucked away if not needed. To make it even bigger you can expose a third zipped-in panel which features a dark mesh window on each side. There is also a large mesh peekaboo window on top of the canopy, so the air circulations should be great even on the hottest summer day. I also like the magnetic peekaboo window closure (instead of noisy Velcro that can wake up your sleeping baby). It also has a double quilted stitch work inside of the canopy to make it even fancier. This canopy is one of the best on the market. It provides full coverage from the sunlight and has plenty of mesh for the air to get in. LOVE it! -Adjustable handle bar. The telescoping handle bar has 3 different positions and goes from 38″ to 42″ from the ground. The cool thing about the handle bar is that it’s covered now with hand-sewn vegan leather instead of the rubber. I also like that ‘nuna’ logo imprint. Now, some parents complained that it doesn’t have an easy curb-pop, meaning it takes some effort to lift the front wheels. But, I think it a plus because you don’t want your stroller to tip back easily especially with that flat recline. Also, most parents like to hang heavy diaper bags off the handle bar (I do! ), and that along can tip the stroller back. -Reversible seat. The seat is 11.5″ wide with 19.5″ seat back and a measurement of 22″ from the back of the seat to the top of the canopy. reversible seat has one-hand lever recline (my fav recline type) with 5 different positions including a true-flat one suitable for a newborn. I like that you can lift the leg rest and recline the back of the seat creating a bassinet-like environment so your child can take a long nap. Very convenient for quick diaper changes too. The seat is suitable from birth and up to 50 lbs. Of course I always recommend getting an infant insert before putting your newborn directly into the seat. To reverse the seat, grab two handles on the sides and push on the built-in buttons, swing the seat around and pop it right back in. Now your child can face you. Super easy! It has the same recline positions in both modes. BTW, the seat is very upright in the most upright position. The fabric of the seat has been upgraded to hand picked tweed textiles blend which feels very plush and lux. It’s still ecco friendly and free of any harmful substances. The fabric is very breathable which is another big plus. I know this is an important feature for parents who live in warm climates. -Bumper bar. INCLUDED! The swing-away bumper bar is covered now with the hand-sewn vegan leather instead of the fabric. Easily removable. -Storage pocket. There is a small pocket in the back of the seat where you can put small items like cell phone, keys or wallet. You can also get a cup holder separately. Stroller organizer – Skip the cup holder and get an universal stroller organizer instead! That way you can take not only your coffee cup, but also a LOT of stuff including keys, phone, water, wallet, snacks, diapers, toys, and more. The amount of stuff I can fit into this organizer is unbelievable. And, the best part is that I can use it on ANY of my strollers. The Ethan & Emma organizer is my favorite so far. -Adjustable leg rest. It has 3 different positions. To adjust the leg rest, all you need to do is press two buttons on each side and lift it up. While the adjustable leg rest is not really needed for an older child, it’s a great feature to have for a baby. It’s just not that comfortable sleeping with your legs dangling down. So ability to fully recline the seat and lift up the leg rest for a full stretch is always high on my list. Even if your baby is not sleeping, it’s nice to have an extra room to stretch their little legs. I also like that the foot rest area has a an easy to clean fabric. -Parking brake. The single parking brake between rear wheels has color indicators and is flip-flop friendly. No shoe scratches! -Huge basket. Shopaholics will absolutely love this huge basket. You can fit it all! LOL. When my daughter was younger I often didn’t want to put her into the dirty shopping cart seat. Even with the seat cover it wasn’t as comfortable as the seat of the stroller. So, I would just shop with the stroller and load up the basket underneath. It can fit a LOT of groceries. -Wheels. It rolls on four foam-filled hard-rubber wheels with 10″ wheels in the back and 7″ wheels in the front. Foam-filled means you will never get a flat and don’t need the air-pump. The front wheels are swivel, but can be locked straight. The wheels have been updated and now are black with chrome accents. Sleek! This all-terrain stroller can handle a lot of different surfaces including mulch, grass, and uneven city streets. While this tires might not be air-filled like many true-all-terrain tires are, I still think they are more than enough for everyday life. And since UPPAbaby advertises Vista as an all-terrain stroller with very similar wheels, I am sticking with it. The maneuverability is great and you can easily steer it with one hand. -All-wheel suspension. Absorbs some of the bumps making the ride much smoother. -Easy fold. The fold is pretty compact for a reversible seat stroller and it folds right with the seat attached. The frame collapses very easily activating an automatic lock. The folded dimensions are 16″H x 23.2″W x 35.8″L. To make it more compact you can remove the wheels. You can also roll it behind you like a luggage. -Car seat adapter. INCLUDED! It comes with infant car seat adapters for Nuna PIPA car seat. BTW, Pipa is one of my favorite car seats. It’s worth mentioning that there is also a different so called ‘ring adapter’ that can be purchased separately for $49. The difference is that the ring adapter is one piece and a little quicker to click into the frame. That’s all. You really don’t need to buy it. The included adapters work fine. -Travel system option. You can easily convert Mixx2 into a travel system by replacing the seat with a color matching Nuna PIPA car seat which is one of the best car seats on the market. 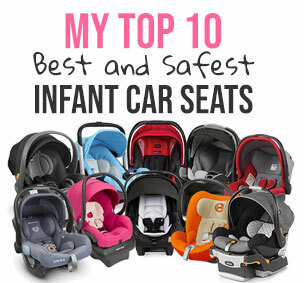 You can also use it with Maxi Cosi car seats (although they don’t officially say it on their web site). -Bassinet option. Love, love, love this bassinet! The bassinet is one of my favorite because it’s not only stylish, but also very practical. It easily connects to the Mixx2 frame without any adapters. Just like the handle bar and the bumper bar of the Mixx2 stroller, the carry handle of the bassinet is covered with hand-sewn vegan leather. The oversized UPF 50+ canopy with pop-out sunvisor has a ‘dream drape’ inside of the canopy that you can expose to provide your baby with complete sun protection. There is also a hidden mesh in the canopy that provides great air circulation. The small storage pocket at the end of the bassinet is very useful for smaller items. When not needed the bassinet can be folded down flat and put away. You can use it as an extra sleeping places for your baby at home. You can get it separately for around $179. Now, I know that some parents might think that this is a waste of money since you will be only using it for the first 6 months. But, I think it’s a great investment because your child shouldn’t be in a car seat for longer than 2 HOURS in 24 hour period. This is because when a baby is in a semi-upright position for a prolonged period of time it can result in a strain on the baby’s still-developing spine and restricted air-flow to the baby’s lungs. The chance of this can increase if a baby falls asleep with their head flopped forward. So, if you are planning on taking your child for a long walk where he would fall asleep, it would be much safer to use a bassinet. Another benefit of using bassinet is that it has taller sides so you child can safely roll into his belly which is not possible if he is secured by a harness in a car seat or a stroller seat (even with a flat recline). I also like how taller sides protect my baby from the wind (great for children born during winter months). Sometimes when my daughter had problem falling sleep for a nap, I would put her into the bassinet, attach it to the stroller and take her on the deck where I would rock her to sleep while reading a book. Then I can just leave her there and go cook dinner. This was a lifesaver! -Rain cover. INCLUDED! It’s nice to have a rain cover, but honestly in all my years of strolling I’ve never had to use one. -Infant car seats. The only thing I would like to see is ability to work with other car seat brands. Right now it works only with Pipa and Maxi Cosi. Here is a helpful video overview. The Nuna Mixx2 2017 comes in five colors: caviar, berry, jett, indigo, and brown. You can get Nuna Mixx2 right now for around $599 and comes with rain cover, car seat adapters, and a bumper bar. You can also get the whole travel system with Nuna Pipa car seat for around $899 (free shipping). The great new is that there are bunch of accessories available for purchase. You can get a child tray, cup holder, footmuff, and travel bag. The bassinet is also available! I was planning on purchasing the Nuna Tavo but now this review came out and I am torn. Is there a huge difference other than the reversible seat and bassinet option? How important are those 2 factors? My son was born a little over a year ago in Dec 2015, and this was a stroller I really wanted to get, but I didn’t because there was no included bassinet. I ended up with the bugaboo chameleon that I got from a Nordstrom sale, but with all these new upgrades for 2017 strollers, I wish I could go back in time! I love this one and the new upgrades to the look of the uppababy cruz! if these were around just a year ago that would have been awesome! Do you know whether Nuna would release another version of Mixx in 2017 without the bassinet? My baby is already 4 months now and may not fit in ( or no longer need) the bassinet now but I really like all of its feature, I wonder if the price would go down without the bassinet? If not, could Cybex Priam a better choice since it can be used as a high chair in a restaurant? Am I correct mixx2 is lighter? I’m also wondering whether Nuna has upgraded mixx2’s tires or they just changed the look? I heard the 2016 Mixx has some tire issues which would make noise. I’m a bit worried mixx2 is gonna have the same issue if they only upgraded the look. I notice that Nuna also comes with Nuna Mixx2. What is the main difference between the Nuna Mixx Jett with the Nuna Mixx2? Thanks for the in depth review! I’ve spent a lot of time looking a the MIxx and am very close to purchasing. Only thing that’s holding me back is I’ve heard some complaints that wheels on the original model are very squeaky. Do you know if that’s something which has been addressed in the Mixx II? I️ have a 2015 and can confirm that the wheels are very squeaky. Has anyone figured out how to remedy the issue? Nuna customer service is fantastic. My folding lock broke off. They sent me a brand new frame promptly and free of charge. My friend has a similar positive experience with her Nuna item. Can you tell me if there are any changes between the Nuna mixx 2 Jett collection and the Nuna mixx Jett Collection? I ordered the Nuna mixx 2 Jett collection and received the first Nuna Mixx Jett collection and I am told there where no changes, because the original Nuna Mixx Jett collection already came wirh all the upgrades of the Nuna Mixx 2. Thank you! Do you know if the Nuna Mixx Jett is good in very hot climates too? We have the original mixx, do you know if Nuna will offer the bassinet for individual sale, that would be compatible for future little ones? Hi, does anyone know at what age my baby will no longer fit in this stroller? I can’t decide if I should purchase it or not. The price is high and the quality is great, but if she will only be in it for a couple years, I’m not sure that I should get it. Any suggestions? Hi!! We received our Mixx2 system with bassinet and are wondering if there are any bassinet stands that are compatible? We are expecting our first child in August. Our friends swear by the Mixx and Pipa products! Thanks! I own the mixx however I can’t find a strolled organizer that can strap onto the handle bars correctly. Any suggestions on a brand of organizer (something with storage for cell phone, wallet, cup holder) that can mount on well. The skip hop stroller organizer works great for us. We have the nuna mixx. What color is the “Caviar” color defined as ? Is it black? Hi! I am also debating between the Uppababy and the Nuna Mixx. Have you noticed the frame of the Nuna scratcing easily? We have the 2015 Mixx and i’d Love a toddler board. There is not an official one that we know of. Has anyone found one that can be made to work? Hi, the prices on the site are US dollars? Do they ship to Canada no cost? Can I use the Nuna RAVA convertible car seat with the Nuna Mixx2 stroller. No. You can only use the Pipa infant line with the Mixx2 stroller (adapters to fit many other infant car seats). No convertible seats will ever fit a stroller. Is the Jett Collection grey fabric on the outside or black? It’s hard to tell. I know the Caviar is black but Jett also looks black on the outside of the canopy etc. I was wondering if Nuna Mixx 2 stroller would fit Maxi-Cosi Pria 70 Convertible Car Seat?